Martina Buchholtz, Tobias Lutz, Joanna Jonientz. SARAFINA / SORAYA / SABEEL and EL SAREEI . to PYRAMID STUD / |u|j|w| - arabians. Thanks to Frank Spönle + Team! and winner "most classic head"
Our warm thanks to SCHOUKENS-TRAINING-TEAM. You are a breeder or owner of straight egyptian arabians in Europe? Than you are invited to be member of PYRAMID SOCIETY EUROPE e.V. Membership-application in pdf-format (244KB) please download here. our warmest congratulations to the breeders and owners of the horses. Haupt- und Landgestüt Marbach again. of the stallions at Alsfeld/Germany - Schloss Sickendorf Nat. C-Show. where placed 1.,2.,3. of 8 starters at filly-classes . PYRAMID NOUR EL NIL get 3. at junior-mares. and 2. of the older stallions class of ARABESQUE EGYPTIAN CUP 2008.
of 1-year old fillies-class at Int. B-Schau. is now a "egyptian-egyptian" - congratulations to the new owner. 2005 August 07, big success for our youngsters PYRAMID LAYYAN "K"
and PYRAMID LANEYA at the EGYPTIAN EVENT EUROPE 2005 in Baden-Baden/Iffezheim. out of SHANAH HALIM did great at the foalclasses. at the World-Championships 2004 at Paris. 3. place at the int. A-Show in Vilhelmsburg/Dänemark. PYRAMID LANEYA steped from success to success. won the class of 1-year old fillies. 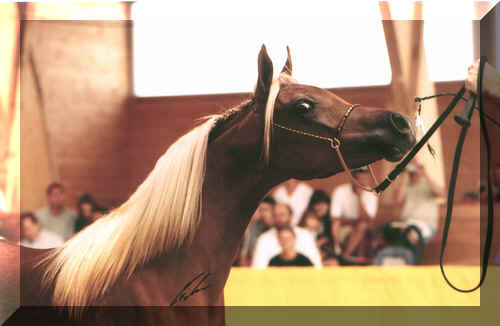 and was named "reserve champion stallion" at 2. ARABICA Schotten (intern. C-show) . 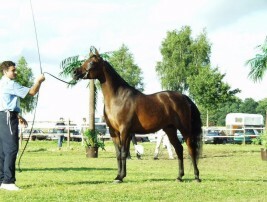 PYRAMID AALIN get 2.nd place at 4-6 year old stallion-class. PYRAMID LAHARA "K" get 4.th of 7 starters at the same show. EGYPTIAN EVENT EUROPE 2004 takes place from July 30. to August 01. Arabian Futurity Europe is a new initiative for Breeders of Arabian Horses in Europe. and Karl-Heinz Stöckle in cooperation with Eric Blaak and Gregor Aymar. 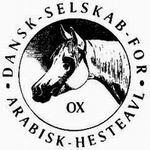 Arabian Horse Events in Europe. Have you been at the page of EAO already? Also known as EL ZAHRAA-Stud - Click please! 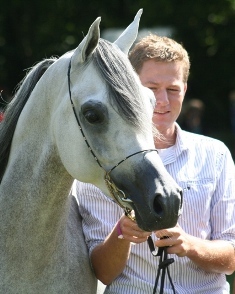 The EEE 2003 in Baden-Baden/Iffezheim was a big success for our little studfarm. Further info´s at the pages of PYRAMID AALIN and PYRAMID LANEYA. at end of June 2003. PYRAMID LAHARA "K" our 2003 offspring from AL LAHAB x BINT KAHILA is born!!! Pic´s to "World-Champion of lady-killer" - click here !!! Page of Dirnhofer-Family - Birkhof-Stud is "ON" !!! is one of the first straight egyptian AL LAHAB - foals.